Signed Modern Floral Oil Painting from Peru, "Flower Mosaic"
A floral mosaic is featured in this beautiful painting by Peruvian artist Miriam Chipana. 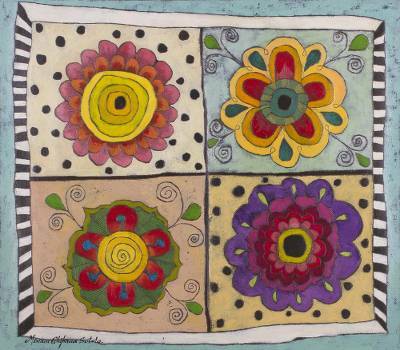 Working with a modern style, she uses vibrant colors to paint the four flowers within square shapes, inspired by themes of symmetry and geometry. Titled Mosáico sobre flores in Spanish.